A bright and cold morning to start the new month. This solitary Daffodil is covered with dew, but escaped the touches of frost that covered many low growing plants, such as these young White Dead Nettle leaves. Something I should have mentioned a few days ago is that I have been hit by the first attack of hay-fever. Two days ago it was particularly bad, and I have a slight case of runny nose and itching eyes after going out this morning! 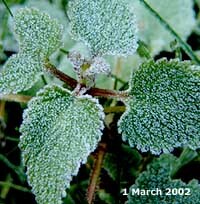 2 March - Another frost this morning, with the temperature low enough to cover the ponds with ice. All the ice had vanished by mid-morning. Although we have not seen the Song Thrushes in the garden for some time now, they are still about and I spotted (and heard) one in the trees of the Nature reserve at around 7.15am. This afternoon there was another visit by a Sparrowhawk that tried to surprise the birds in the Hawthorn - failed again! 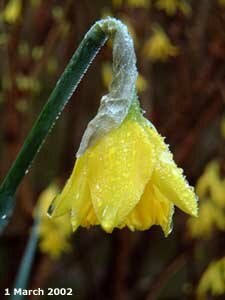 3 March - A Dull, cloudy day with no sign of frost this morning has been a quiet one so far in the garden. The Sparrows make regular visits to the feeders without any signs of Springtime behaviour. 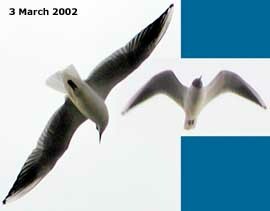 The noisiest moments seem to have come from the gulls that seem to overfly us in the afternoons recently. There seem to be two types. My gull recognition leaves something to be desired, but the one on the right appears to be a Black-Headed Gull, but I need to get some better pictures to ID the other one. 5 March - A mild day (max 13C) with some sunshine did not bring a great increase in activity in the garden. The Dunnocks have starting chasing each other high up in the conifers and their calling can be heard frequently. The Sparrows engaged in more tussles today, but there is no sign of any gathering nest materials yet. The picture shows a Hairy Bitter Cress, growing almost un-noticed near the pond. 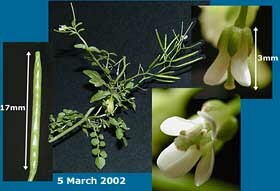 Its tiny flowers develop into long, thin seed pods. 7 March - A day more worthy of early summer today with sunshine and a high of around 17C. No garden pictures taken, but I spent some time watching the antics of three Dunnocks. It appeared to be two males, who did a lot of displaying with rapid wing movements, and a female who seems to be giving them the run around. 8 March - Another bright, mostly sunny day with the temperature up to 13C at 11.30am. As I walked down the garden this hoverfly caught my eye, landing briefly on our big bamboo plant - the first hoverfly I have seen this year. 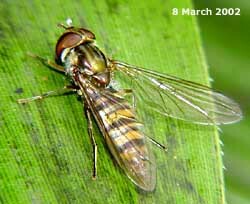 The narrow bands on its abdomen suggest that it is Episyrphus balteatus, a species that is abundant in gardens. 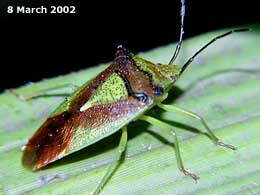 A check of the bamboo leaves also revealed this Hawthorn Shield Bug (Acanthosoma haemorrhoidale). Later in the day I also spotted a Bumble bee and a yellow coloured butterfly (in the distance). 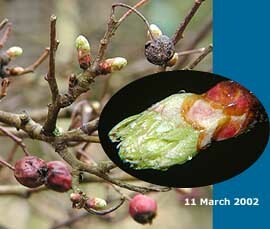 11 March - On a damp, overcast morning I can see the bright green of buds starting to burst open on the hawthorn, still covered with large numbers of berries from last year's very successful flowering. A look back at the 2001 diary suggests that this is happening earlier, by about a week. 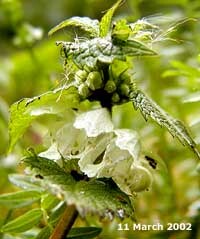 Another plant that is flowering a week earlier is the White Dead Nettle, this one is by the big pond. 12 March - Not a lot to report on a dull day. 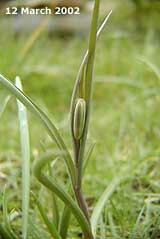 By the side of the pond the Snake's-head fritillary plants now have flower buds developing (see picture), although it will be a while before these are ready to open. On the bird front, I still have not seen any signs of either the Robins or Blackbirds nesting in the garden. In fact, the local Blackbirds still seem to be competing for territory - I am seeing at least two males and two females about here, usually chasing each other when not coming down to feed. It is very different to the last few years when we had our settled residents. The Wood Pigeons are returning (two here today), so I may need to replace the mesh around the feeder. 14 March - The last two days have been miserable days in the garden, with lower temperatures (yesterday <7C, today 5C max), cold winds and today we have had a little snow falling before rain all afternoon. Even the birds have been keeping a low profile and the feeder has not emptied by very much all day. The sparrowhawk turned up at lunchtime, but left still hungry. It perched on top of the hawthorn but did not attempt to flush out the Sparrows that were in it.